We got on the plane and almost instantly fell asleep! A quick two hours later, I woke up and we were flying right over the island, it was SO beautiful and I was so excited to get there! We landed and walked off the plane, the hallways of the airport were filled with beautiful orchids and everything outside looked green and gorgeous. Randy spent so much time in the airport there, picking up and dropping off missionaries, so he had SO many stories there. We stopped and got some ice cream in honor of one of his stories about wanting ice cream and then seeing an entire family that had some! It's called Blue Seal ice cream and it's only on Okinawa, and it was SO good. We got out of the airport and bought a monorail pass to use for the few days we were there, and took off for our hotel. We rode by apartments that Randy had investigators in and he knew the music that played with each stop. We got off the monorail and walked by Naha Main Place that Randy talked about all the time. We walked around the block to our hotel and dropped off our luggage. 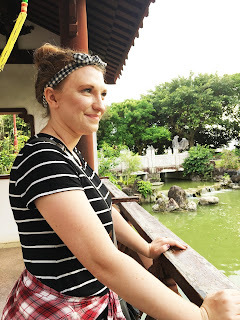 I was SHOCKED with how hot Naha was! It was probably only 80 degrees, but it was 50000000% humidity and it was crazy how hot it was. I have been in Arizona in the middle of July, I've been in Utah during 115 degree heat, but Naha was probably the hottest place I've ever been because of that stinking humidity. We walked for five minutes and we were both drenched in sweat. I tied my hair up because all the curl was gone and it was making me too hot. We walked from our hotel to Naha Main Place and Randy had a million stories about each little shop and spot on the walk, it was sooo cool. We grabbed a donut from Mister Donuts (a pretty well known donut spot) and a drink, and some ice cream. We wanted to go to the missionary apartment so I could see where Randy lived and say hello to the Elders, and take them a treat! We went to Randy's old apartment and both of us were just in awe with how surreal it was to be there together on this island that meant so much to Randy. We got to Randy's old apartment and he was just going crazy! Unfortunately, the Elders weren't home! So we snapped some pictures and decided they probably were at the church if they weren't at their apartment at that time. We walked to the church and of course Randy was telling me stories about things that happened on every part of the sidewalk. Some of the places even looked familiar from videos he had sent me which was really coo. We got to the church and saw a bunch of bikes and we knew the missionaries must be there! We snapped a few pictures and went inside to leave the ice cream, so we wouldn't disturb their meeting. It was SO crazy to be in the church building and we were sad we wouldn't be able to come to English class or church while we were there. We left a note and the ice cream and headed back out. We walked to the most popular street in Naha called Kokusai Dori. It was SO busy and loud and super fun, we made a lunch reservation and walked around and shopped and Randy reminisced. We went to the bus station to make sure our plans for the next day were set, and went back to eat yakiniku. You walk in and get a plate and fill it with raw meat, and you get other plates and bowls with rice and curry and soup and other sides. Then you go to your table which has a huge grill inside of it. You just pop the meat on and cook it, then eat! It was SO delicious, I loved it! We ate and ate until our time was up (you have a time limit since it's all you can eat) and then we were back in the city. It was SO hot and we went and saw a bunch of Randy's favorite places and people watched. We went back to Naha Main Place for some shopping and then went to check into our hotel. It was SO hot we sat in the air conditioning for a bit to cool down. We decided to walk to the beach after that. Randy told stories about how Okinawa came to be and why it has Chinese influence on the way, and we passed this beautiful wall and peeked inside and saw a gorgeous garden. We decided to stop in. 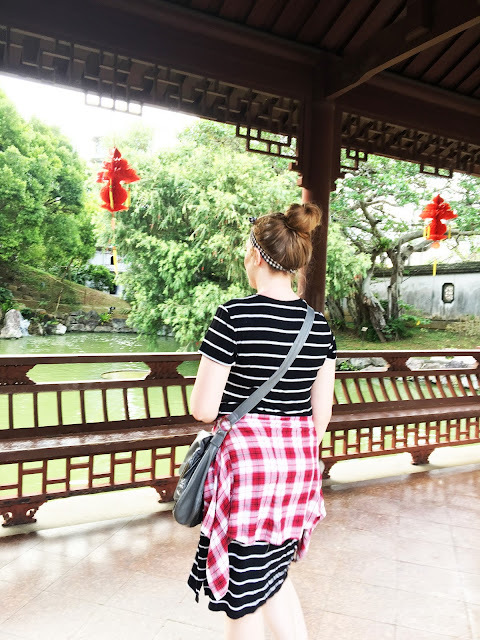 It was SO insanely beautiful, it was a garden built to show the uniting of Chinese and Japanese style and architecture and to be an oasis in the busy concrete city. After WWII and the Battle of Okinawa, the city was left desolate, so the US came in and helped the infrastructure but because of the distance and cost, the city is a bit of a concrete jungle. The garden is a beautiful piece of nature in all the city. We fed coy and turtles and there was this little teeny turtle that was about 1/4 the size of the others that I was trying to feed, but the big turtles kept picking on it and literally shoving it under water and out of their way! It was so funny and sad. There was also this beautiful waterfall you can walk under and then on top of and it was so awesome. We kept walking to the beach and we saw feral cats EVERYWHERE. The beach was so beautiful and we waded in a bit, the sand was warm and beautiful and the water is INSANELY blue and warm. It was just gorgeous. After we talked and took pictures at the beach, we went back to Kokusai Dori for dinner. We went to one of Randy's favorite ramen shops where you select your ramen out of this cool vending machine thing, then order your extras with it. It was amazing ramen and it's safe to say ramen is ruined for me now! It was finally cooling down so we walked the streets some more, stopped and got more Blue Seal ice cream which was SO good. Randy got Okinawa Salt Cookie which is DELICIOUS and I got a chocolate cookie swirl which was amazing. We slowly walked back to our hotel, just reveling in the fact that we were there. We got back to our room and blasted the air, and went right to sleep! I can't even explain how amazing it was to get to be in the places where Randy served as a missionary. I imagined those places for 2 years while he was gone, I prayed for people there and loved them and the places, and to actually get to see them was something I will never forget. It was so beautiful to see the places that play such a huge part in Randy's testimony, to see where he became the person that he is, and to get to walk with him on those streets. This is really sappy, but I feel like being there, seeing the places I'd only read about, was just too good to be true. I'm still pinching myself that I got to see a country and cities that are so important to him! It was really a dream come true.